If systems with GTX 10-series GPUs start appearing later this year, the 2016 Blade will have a tough time competing. If you need a laptop today, and can’t wait for the 1070 to go mobile and start making its way into products, the 2016 Blade is a solid choice. A new typeface: Razer made this update on its peripherals and the Blade Stealth earlier this year, and now it’s come to the Blade. Gone is the heinous “gamer-friendly” typeface that Razer used to slap on its products. In its place is a lightweight sans-serif that looks—dare I say it?—completely normal and inoffensive. Changing up the typeface on the keyboard isn’t the most amazing year-over-year change, but it’s absolutely an improvement. It’s probably the 2016 model’s most notable aesthetic difference, too. Razer has always tried to position the Blade as a gaming-friendly MacBook, and now those comparisons seem even more apropos. 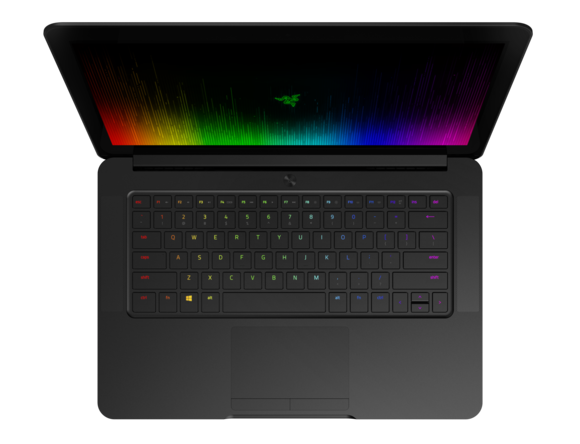 Oh, and it lights up: One more keyboard-centric change, and then I swear I’ll be done: Like the Blade Stealth, the 2016 Blade features Razer’s per-key Chroma lighting, aka 16.8-million color RGB. Is it completely unnecessary? Sure. Does it look nice? Sure. USB-C: Okay, enough about keyboards. This year’s Blade packs a Thunderbolt 3 USB-C port. However, the system still charges through a power brick with a conventional barrel plug. This is in stark contrast to the Blade Stealth, which charged with the USB-C cable only. Me? I’m happy with this state of affairs, as I didn’t love the USB-C charger on the Blade Stealth. It does make the Blade a bit less portable, though. So what’s the USB-C port for, if not charging the laptop? Presumably, it's for the Razer Core (Razer’s external video card shroud)—provided you can get your hands on one. A handful have shipped to people who pre-ordered, but if you want one right now, the next round won’t ship until the end of August. Of course, it’s also a future-proof port, so expect to use it for all sorts of peripherals in the coming years. The Core is just Razer’s big USB-C selling point. In the meantime, you’ll likely get more use out of the three USB 3.0 Type A ports, headphone jack, and HDMI port also on the Blade. Cooling: This update gets into the nitty-gritty of “things most people wouldn’t notice unless you told them”—Razer redesigned the cooling in this year’s Blade to keep heat away from the keyboard. Why? Well, with past Blade models, the aluminum strip between the keyboard and screen would get hotter than the surface of the sun during gaming. We didn’t have a 2015 Blade around for comparison—so we’re running a bit on faith here—but anecdotally, the 2016 Blade does seem better designed. Heat now appears to be contained in two main areas: the center of the underside, and then two key regions towards the center of that strip above the keyboard. And while it still gets uncomfortably hot, it doesn’t reach the searing “cook an egg, or maybe just your fingertips” temperatures of previous Blades. One weird side effect: Part of the keyboard now gets warm. Not hot, but warm. It feels strange when you first notice it. Also, the Blade gets loud and whiny when gaming. Tiny fans, high speeds. You’ve been warned. As for under the hood, the story is still one of small, expected steps forward. Inside, the 2016 Razer Blade sports a Core i7-6700HQ, Nvidia GeForce GTX 970M, and 16GB of RAM. You get a jump from a 4th-generation Haswell (Core i7-4720HQ) to a 6th-generation Skylake, and the 970M’s RAM doubled from 3GB to 6GB, but the specs haven’t changed wildly to something unexpected (or exciting). The system also now uses a PCIe SSD (instead of an mSATA SSD) for a bit of extra speed. One note about that 970M: Don’t expect to play high-end games on the Blade’s 4K UHD screen with it. That said, the display itself is great for day-to-day desktop and browsing use. It’s a bright, beautiful 3200x1800 IGZO panel with superfluous multi-touch for people who like dirtying up their laptop screen. Color reproduction is surprisingly good even at wide viewing angles. The one downside is a ton of glare: A glossy panel is better for color, but you’ll only be able to fully appreciate that fact in the dark. The Blade is a solid performer, given its small chassis. In PCMark 8’s Work Conventional test, which simulates office work like word processing, video chat, and web browsing, the Blade scored 3,025. That number is lower than other systems with older quad-core mobile processors, probably because of the heat constraints of the Blade’s compact dimensions. (The balancing act that a company must strike between heat, fan noise, and performance gets tougher the smaller the system.) Any score above 2,000 should be a solid experience for getting work done, though. 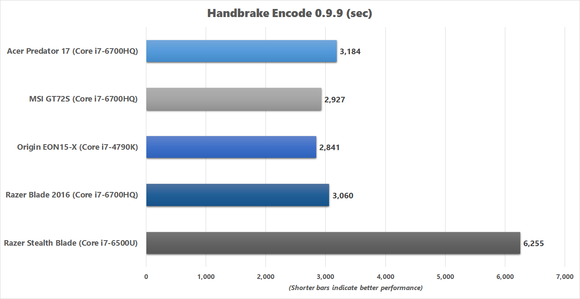 The quad-core Skylake does show up for battle in our encoding test, where we use Handbrake to convert a 30GB movie file to an mp4 using the Android Tablet preset. The test is all about the CPU, and here Blade finished its task in approximately 51 minutes. That’s pretty damned good. 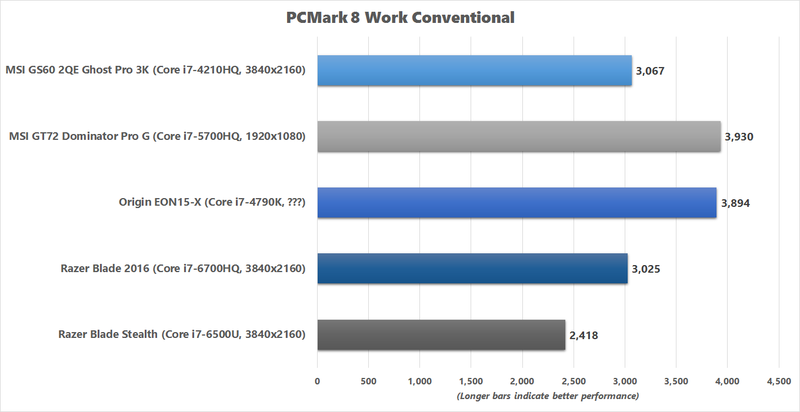 By comparison, the much larger Acer Predator 17 with the same Core i7-6700HQ is slightly slower at 3,246 seconds, and the MSI GT72S (also a Core i7-6700HQ) squeaks out in front at 2,927. Both those laptops are much bulkier, I might add. For gaming performance, the Blade posts typical 970M numbers. 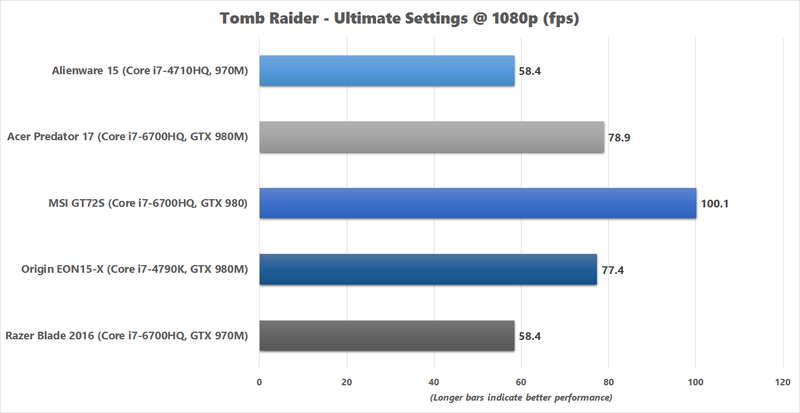 In fact, when benchmarking Tomb Raider on Ultimate settings and running at 1080p, we ended up with the same frame rate on the Blade (58.4fps) as an 970M-equipped Alienware 15 we tested last year. That’s all right, but it’s not what you’d get from a GeForce GTX 980M. For example, Origin’s 980M-equipped EON15-X managed 77.4 frames per second in Tomb Raider at the same settings, and the Acer Predator 17 scored 78.9fps. Things are even bleaker if you compare the Blade to a laptop sporting a desktop 980, such as the MSI GT72S Dragon, which reached a whopping 100.1 frames per second. Why mention the 980, when the Blade is about half the size of any 980M- or 980-equipped laptop? 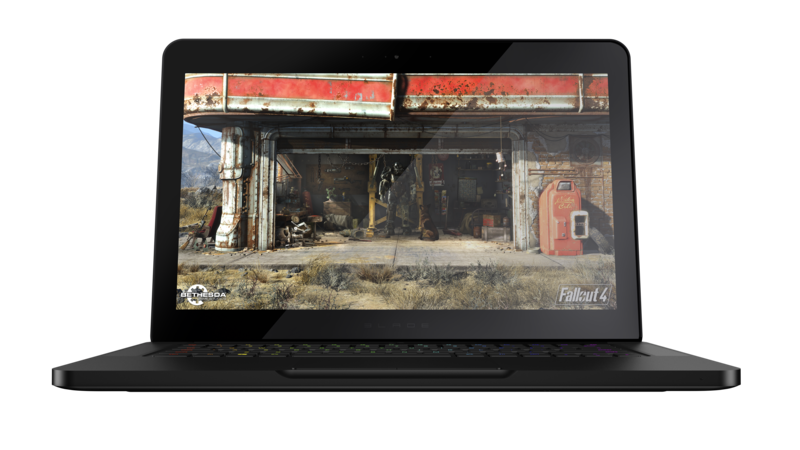 Because if you buy this machine now, getting just a little under 60fps in a three-year-old game will seem even more depressing whenever Nvidia GTX 10-series mobile parts appear and wallop on every 970M, 980M, and maybe even laptop-sized 980 in sight. This Blade is something of a stopgap release, though. Nvidia has still yet to announce anything official about GTX 10-series mobile parts, so at this point, really all Razer could do was to double the VRAM on the 970M, upgrade the processor, and put in a faster SSD. The good news is that this Blade is commensurately less expensive, given its older GPU. The 2016 model costs $3,000 for the 256GB SSD configuration (its $300 more for the 512GB version) which is refreshingly close to what it costs in the US. We've seen some epic price hikes lately so Razer should be congratulated for this. Sure, you can find a similarly spec'd laptop for a few hundred less, but not one that crams this performance into such an ultraportable form factor. Add in USB-C, the promise of the Razer Core, and that PCIe SSD? Pretty snazzy. So if you need a laptop today, and can’t wait for the 1070 to go mobile and start making its way into products, the 2016 Blade is a solid choice. Just be aware it’s not a very future-proofed option at this point.